Cleburne County is located in the northeastern part of the State of Alabama. 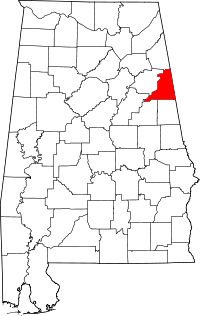 Cleburne County was created by an act of the Alabama Legislature on December 6, 1866 from territory formerly contained in Calhoun, Randolph and Talladega Counties. The county was named for Patrick Ronaine Cleburne, a Confederate Major General. A large area of the western portion of the county is part of the Talladega National Forest. The county seat was established at Edwardsville in 1867, and moved to Heflin in 1906. Another town of note is Fruithurst. ~ Source: Ancestor Swap Meet 2003 book, June 21, 2003, Northeast Alabama Genealogical Society. Content has been rearranged for better readability.